MoistureShield is expanding its family of composite decking products to include a co-extruded and enhanced capped boards with MoistureShield’s signature moisture-resistant composite core. Advanced Environmental Recycling Technologies, Inc., (A.E.R.T. ), the innovation leader in composite decking, is enhancing its product lineup with two new MoistureShield composite decking collections. The new lines, MoistureShield Refine™ and MoistureShield Infuse™, balance the proven performance and durability of A.E.R.T.’s proprietary manufacturing processes, with advanced technologies designed to enrich aesthetics and revolutionize composite performance standards. With these new decking products MoistureShield’s comprehensive offerings ensure the right innovative outdoor living solution for every lifestyle, design and need. MoistureShield Refine is the perfect combination of natural beauty and advanced durability. It enhances MoistureShield’s proprietary moisture-resistant core with an added layer of protection and beauty that features enriched natural coloring and enhanced durability, providing unrivaled warmth and elegance. Refine’s integrated cap not only produces beautiful boards, it also provides enhanced durability to hide wear and tear, along with fade and stain resistance. Each Refine board provides an advanced blend of enriched natural variegation and high definition wood-grain detail, finishing every deck with luxurious beauty. 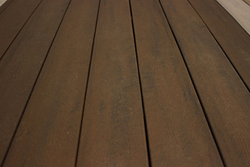 MoistureShield Infuse redefines composite decking with its true wood beauty and high performance durability. Infused with MoistureShield’s innovative CoolDeck® technology, that optimizes heat reflection, the boards absorb up to 35% less heat than conventional* capped composites in similar colors. Thanks to an exclusive Co-X™ manufacturing process, these boards set a bold new standard in realistic wood-grain finish and enriched color variegation. With an enhanced color palette of deep earth tones, Infuse balances engineered durability with natural beauty, making it the ideal solution to infuse any outdoor space with character and style. Both MoistureShield Refine and MoistureShield Infuse will be available in 1 in. x 6 in. (nominal) deck boards of 12 ft., 16 ft. and 20 ft. lengths and 12 ft. fascia boards. MoistureShield protects the products with their signature lifetime residential warranty and a 25-year fade and stain warranty. MoistureShield composite decking is the only composite tough enough to be installed on the ground, in the ground or underwater while still being protected by the industry’s leading lifetime residential warranty. MoistureShield’s family of outdoor living products offers the right options to fit every backyard. Homeowners can choose from several high-performance composite decking and railing lines, as well as complete their deck design with MoistureShield Deck Lights, MoistureShield Deck Clips and Pro Aluminum Railing. Built to be tough, yet beautiful, all MoistureShield products inspire carefree living while making a statement. Advanced Environmental Recycling Technologies, Inc., (A.E.R.T.) trades on the OTCQB venture stage marketplace for early stage and developing U.S. and international companies. The development of new technologies and patents has enabled it to manufacture superior composite products from recycled wood fiber and recycled polyethylene plastic for the building and construction markets. A.E.R.T. is the exclusive manufacturer of MoistureShield® composite decking and outdoor living accessories. Investors can find Real-Time quotes and market information for AERT on http://www.otcmarkets.com. Details about MoistureShield products can be found at http://www.moistureshield.com. *Conventional capped composites produced by A.E.R.T.